Only use the memory function on the driver's side when the vehicle is stationary. You could otherwise be distracted from the traffic conditions by the seat moving of its own accord, and as a result cause an accident. 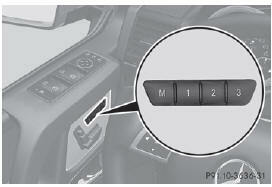 ► Make sure that the SmartKey is in position 2 or that the respective door is open. ► Adjust the seat and head restraint . ► On the driver's side, adjust the steering wheel and the exterior mirrors . ► Press the M memory button. ► Press one of memory buttons 1, 2 or 3 within three seconds. The settings are stored in the selected storage position.